Two leaking underground storage tanks (USTs) resulted in soil and groundwater contamination at a service station in Michigan. Naphthalene, trimethylbenzene (TMB) and benzene, toluene, ethylbenzene, and xylenes (BTEX) contamination were discovered in the subsurface prompting the need for remedial cleanup. Michigan DEQ began remediation via UST removal and soil excavation. A total of 4,000 cubic yards of contaminated soil was removed. A pump and treat (P&T) system was installed and operated for 8 years through November 2003. The system removed 1,575 pounds of BTEX and significantly lowered contaminant concentrations. However, the P&T system reached asymptotic conditions and would not be effective in achieving site closure goals. Regulators began looking into new ways of accelerating the remediation process and reducing the overall cost of cleanup. Enhanced aerobic bioremediation using ORC Advanced® was deployed to replace the P&T system and degrade the remaining contamination. The remediation objective was to continue the reduction of petroleum hydrocarbons in the subsurface and reduce the cost to closure. Three months after the P&T was shutdown an ORC Advanced application took place. 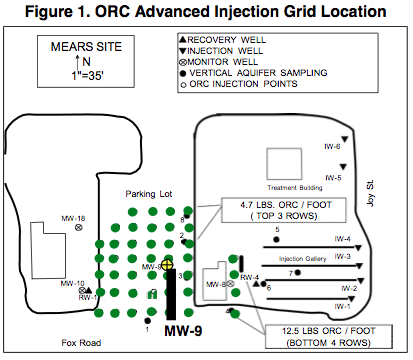 The ORC Advanced injection included 43 injection points in a grid design within the contaminated area surrounding well MW-9 (Figure 1). An increase in rainfall during certain parts of the remedial period contributed to some of the increases observed in Graph 1. During wet periods, an increase in concentrations resulted from the mobilization of contaminants within the capillary fringe smear zone. An infiltration gallery was installed to flush the contamination into the dissolved-phase where it was available for P&T removal. Prior to shutdown in November 2003, O&M costs were increasing and low-level dissolved- phase concentrations were still elevated indicating the system was not effective at reaching the required low cleanup levels. 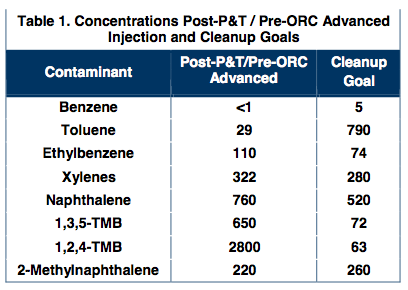 Within 60 days of the ORC Advanced application, low-level concentrations were significantly reduced below post-P&T levels. Reduction continued throughout the monitoring period and a 99% mass reduction was achieved approximately 13 months after the initial injection. 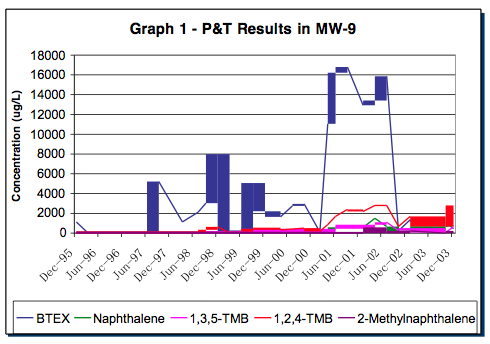 In well MW-9, concentrations in all contaminants were reduced to below the cleanup goals. The ORC Advanced application eliminated increasing O&M costs of an aging P&T system and allowed the site to be closed years ahead of projections.